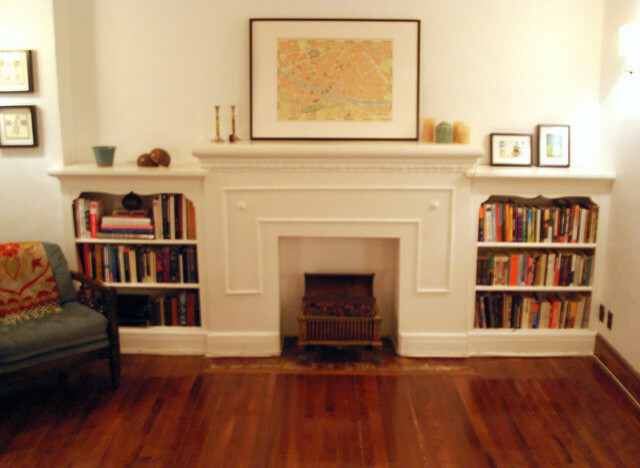 While planning the guide to mantel decorating, we debated even running the story. Though a beautifully decorated fireplace is certainly festive, most of us at Stylelist/Stylelist Home don't even have a mantel to call our own. But what if we told you that there was a way to get a working fireplace into your home without having to do any construction or renovation whatsoever? Because you totally can, thanks to portable fireplaces. We know, it sounds a little corny. Like we're going to be suggesting running a "yule log" dvd. But we're not. We've found fireplaces give off heat, aren't too pricey and look just as good as the real thing. And in the case of "gel" fireplaces, you'll even get a real flame. Convinced yet? Here's a rundown of what you can expect to find at your local home store or online. Electric inserts If you have a mantel, but a. are afraid of actually lighting a fire indoors or b. the opening has been bricked-up for decades, this is a great option. It's just a portable heater that you can stick inside the fireplace. Some look like piles of wood, others are more like a space heater. For some reason, QVC always has a good selection of these. Electric fireplaces Here, you're getting a pre-fab mantel and an electric insert. The price range is pretty wide, mostly due to the quality of the mantel. One thing is that you should never pay extra for a different color (unless you're buying 100% wood), since you can just paint the mantel using a high-temperature safe paint. Also, remember that when you're quoted a size, it's usually the measurement of the insert (diagonally, like they measure for televisions.) Our favorite is the 23" Chimney-Free Electric Fireplace from Home Depot. Gel fuel fireplaces These have gotten more and more popular over the years. You won't have to plug anything in for this option, which makes it a great choice for those of us with…interesting…floorplans, where there isn't an outlet near your desired fireplace location. Here, the insert comes with cans of gel that you light with a standard fireplace match. You get a real flame that gives off a surprising amount of heat. The downside is that you have to buy gel replacements, which can be a pain. But, Overstock always has a good range of options in this category.